2016 Challenge - Select up to five projects that are less than 50% complete and pledge to complete in 2016. There is a one time opportunity to change one of your choices at the June meeting. In January 2017 we will re-cap the completed projects and select a winner at random. All stitchers who have finished by the January 2016 Meeting will be entered into a drawing for a gift certificate towards framing! Here's a larger pix of the top section. Only two colors. The model was stitched in Gloriana Silks. You are free to use the colors used in the model or select your own. 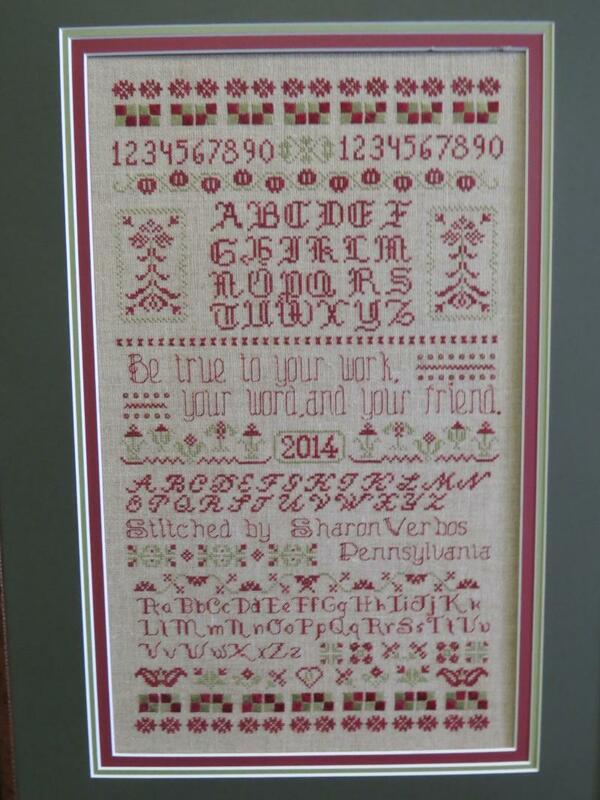 Soon I will post some of our WIP's and share all the varieties of color selections stitchers are using. Linen ready, floss ready and basting stitches in - We will start with rows 2-1-3 or rows 5-4-3 for April/May 2013. Sides three and four of four ready to assemble. Looking inside the etui, not quite complete. The inside opened once completed. Complete etui, with the top open.